To Fix: Something to mend. To Break: Something to dismantle, dissect, or leave behind. To Measure: What needs assessment? A Talent: A talent to exercise. A Resource: A resource to draw on. A Skill: A skill to apply. What’s Hidden: A latent talent or forgotten skill to develop. How to Unlock It: Strategies to access, develop, or rekindle this ability. Where to Apply It: A potential project or path. Where might this ability take me? With so much work needed to craft a better world, everyone must contribute where and how we can. That means honestly assessing our resources and skills with the longterm goals of producing meaningful work and making valuable contributions to causes larger than ourselves. Our efforts don’t have to be precious or grandiose to be valuable and meaningful. Our efforts do, however, have to align with our personal values and abilities to be productive and sustainable over time. Let’s take this spread one shelf at a time. The top shelf in our toolkit holds tasks. Direct these task cards either inward or outward in the context of resistance work. Looking inward, Card One represents a personal quality to heal or improve to become stronger and more capable. Card Two represents a habit to break or pattern to let go of to improve your work. Card Three represents a trait that requires more reflection and attention as you move forwards. Looking outward, Card One represents a problem to help solve or repair. Card Two represent a toxic pattern to help dissect and release, or a knot to help untangle. Card Three represents a pattern or problem to become aware of, examine, or research without immediate action. Our middle shelf holds tools. These are your personal strengths and assets to draw on as you approach collective work—the unique combination of talents, resources, and skills that you bring to the table. Here a talent is something you have a natural aptitude for, such that you can develop faster in that area than others might with same amount of time and concentration. Talents are driven at least partly by passion and interest. The things you’re drawn to and curious about matter with Card Four. Examine talent not to compare yourself to others in a competitive sense, or to elevate one person above another, but to gain insight on the best ways that you can contribute. What is the wisest way to spend your time and energy towards drawing out your best? A resource is something outside yourself that you have access to use in your work and to share with others. When we think of resources, we often think of material goods like money, food, supplies, land, and space. These may well count among your own strongest resources. Resources can also represent intangibles like time, wisdom, energy, education, information, and ties to community. A skill is a learned ability you’ve developed, relevant to your efforts. While both talents and skills require practice to hone, skills broadly tend to be more practical. A talent is something you practice because you love it or you have an aptitude for it, whether or not it’s helpful or necessary to pursue. (While a drive to pursue a passion may feel urgent on the level of the heart, it’s seldom a matter of food-and-shelter survival.) A skill is something you practice because it’s useful, whether or not you’re wired towards it. A skill may be glamorous and artistic, like design, and a talent may be dull and mundane, like baking casserole. Either can be enjoyable, and either can feel like hard work. For the purpose of this spread, the difference lies in passion, aptitude, and ability—something you do because you can (talent) vs. practicality, labor, and necessity—something you do because you have to (skill). Finally, the bottom shelf in our toolkit holds buried treasure—uncounted resources and forgotten or latent talents you may not be aware of. Card Seven shows something hidden to be developed, which may come of use in your work. This could be a talent, a resource, or a skill. Card Eight advises strategies to uncover, unlock, or nurture the quality revealed in Card Seven. Card Nine covers the potential applications for this quality. Where in life, or to what projects might this resource be applied? Where might this talent take you if fostered? Because this last shelf deals with both occluded, unconscious material and future potential, it may become confusing or difficult to accurately interpret. We’re asking to look at qualities we don’t yet recognize in waking life, so please don’t be surprised or disappointed if you have trouble recognizing a hidden talent or resource reflected in the cards. If the cards you draw here make no sense to you, it may be because they are showing you something you don’t know yet. Please resist the urge to draw more cards, and simply sit on what you’ve got for now. Journal your results and first impressions, then set the reading aside. Sleep on it, meditate on it, give it time, and come back to it another week with fresh eyes. Unlocking hidden potential usually takes time, and the first steps may come in whispers and fragments. That’s all part of the process. The element earth governs this spread. Tool boxes are shrines of treasures, equipment, work, and craft. Rummaging through them, we figure out what we have and need to get things done in this material world. Air marks a strong secondary presence as we bring assessment, measurement, logic, and analysis to our resources. We take inventory and draft plans. The dynamic then is of air serving earth and earth strengthening itself, as the atmosphere cradles and protects the ground, delivering the water and chemicals needed to the right places for land to remain fertile and thrive. The toolkit spread has broad applications. It can examine any area in life where you might cultivate talents and resources to make improvements. That’s a lot of ground to cover! • One Shelf At a Time: This spread is really three in one. Think of it like an actual toolbox. You can pull out one shelf at a time an do a focused, three-card reading on either tasks to undertake, tools to draw on, or hidden talents to develop. You can even do a single-card draw of any one tool in this box whenever you need. • Accentuate the Negative: I’ve focused on positive resources and abilities in this spread, but in choosing our battles, it can be just as important to inventory weaknesses. Add a card to each shelf to represent weaknesses and foils. In the top shelf of tasks, draw an extra card to examine which tasks or fights to avoid for now. 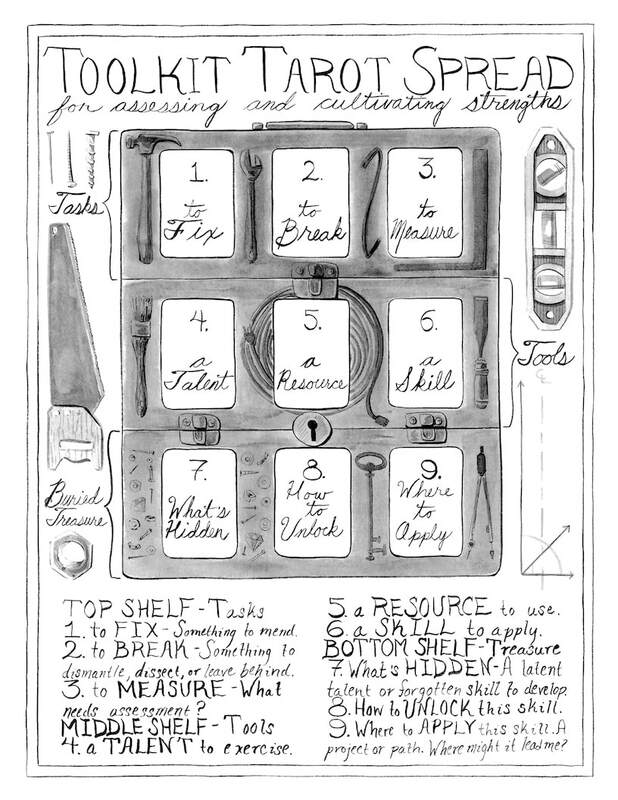 In the middle shelf of tools, draw en extra card to face an area of weakness or natural aversion. In the bottom shelf of buried treasure, draw an extra card to ask where not to apply the new abilities you develop. These negatives can change over time. Areas of weakness can become areas of great strength, but that process doesn’t happen overnight. Examining weaknesses through tarot can invite tough love, so avoid this variation on days when you’re feeling overwhelmed or vulnerable. Save it for when you’re feeling honest with yourself, and grounded enough in your strengths to own your foibles with accountability and a sense of humor. • Creativity: Brainstorm on editing and shaping your projects with the tasks shelf. Assess which talents or media to apply to a given project with the tools shelf. Explore new media and hidden or back-burnered talents through the treasure shelf. You can develop personal codes in your tarot journal to get very specific. For instance, a graphic designer working in mixed media might assign cups (water) as paint and ink, pentacles (earth) as pencils and chalk pastels, wands (fire) as light-based media like photography and digital effects, and swords (air) as cut paper. There are infinite ways to assign detailed, personal meanings to tarot symbols. Tailor your codes to your own media and needs, and record them in your journal before your reading to set your intentions. • Career: Examine what is and isn’t working well on your current career trajectory with the tasks shelf. Check which resources and skills can help most with current projects and upcoming changes with the tools shelf. 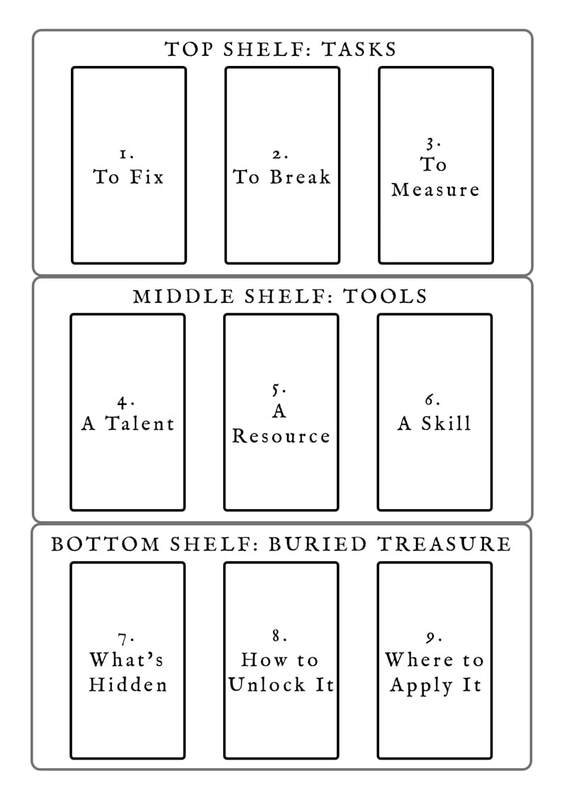 Consult the treasure shelf to search out and develop growth potential in your current field, or perhaps discover a new field to explore. This spread should be a good trick for overcoming writer’s block on resumés, business plans, and elevator pitches. The tools shelf can help you brainstorm, articulate, and own your biggest strengths when it’s time to market them. •Relationships: Use the tasks shelf to meditate on snags, conflicts, and dynamics in your relationships that call for some TLC. What patterns can you mend and what habits can you break to become a better partner, parent, colleague, friend, or lover? What patterns need assessment before they grow into problems? Use the tools shelf to count and bolster all the good things you’re bringing to the table. Use the treasure shelf to uncover potential areas of talent and growth that may help you deepen and strengthen your relationships.